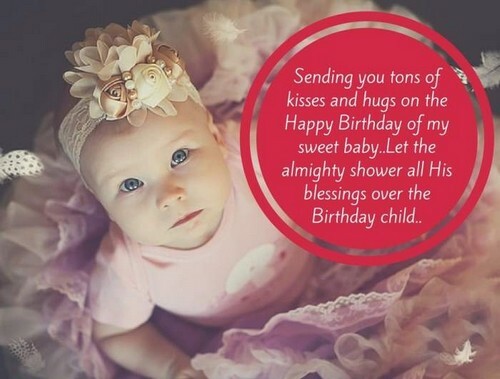 For the new love of the family, for the newly born baby girl or for the little sweet toddler that you have in the family, here are some birthday greetings for her. She may not understand it just yet but she will when the time comes, so you might as well greet her all the same! Heaven has a plan for you, happy birthday baby girl, may you keep enjoying your life. Happy birthday baby girl I am just hoping that God guides you as you are growing up! May you keep being protected by those angels from heaven above, baby girl, happy birthday! 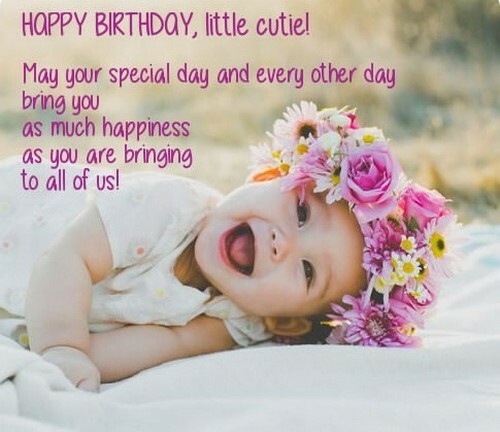 May your life continue on being fun and that you are happy, baby, have a happy birthday! Happy birthday, baby girl, we love you so. Continue to be the source of family’s happiness. You little adorable monster, I hope your parents will guide you and raise you like me. May you always remember me, the one who took care of you all the time, happy birthday! You are like this stuff toy that is cute and fluffy, do expect more hugs from me, happy birthday! I wish that you would grow up to be the most wonderful person ever, happy birthday baby girl. You are amazingly cute and I would love to just take your cheeks, enjoy your big day! I hope that when you grow up, you will remember this birthday of yours, my dear! Happy birthday, I just wish you would grow up to be the most wonderful person ever. Today is one of the most spectacular days of my life because it is your birthday, baby! You are loved by every person in this family and I hope that you know that, baby girl. You will always be our baby girl no matter what happens, happy birthday to you! You are God’s special gift to us, I hope you reach the dreams that you will have one day. Baby girl, you fill everyone’s lives with love and laughter, hope you have a happy birthday! I wish that you live long enough to achieve your dreams, baby girl, happy birthday! Have the most awesome day of your life today, baby girl and just enjoy this day of yours! You have a smile that takes away all of the worries that I have in mind, enjoy your birthday! The first time I held you in my arms and look at your face, I knew I would love you! Your smile is the sweetest thing I have ever seen in my life, may you have a great day! I know you may not remember this day when you grow up but I always will, baby girl. This is another milestone in your life that I will remember you by, happy birthday, girl! You are the cutest thing I have ever seen in my entire life and that is saying a lot! Those cute eyes of yours have captured everyone’s heart here at the house, enjoy today! Your innocence shines off you and it is so amazing, I love it, happy birthday to you! Baby girl you make our loves so much happier and we love it, have a great party today. You are practically the most charming baby in this town, everyone knows, happy birthday. I know you will do great things in this life and so I wish you all the best on this day. I pray to God that you grow up to be the most awesome responsible kid in this town! You are the most precious of all the treasures that I have in this world, happy birthday, girl! When you grow up, I hope that your life will be filled with love and happiness, happy birthday. You will always be my baby girl no matter if you grow up to be taller than me, love. Every time I see that cute face of yours, I just cannot help but smile, may you enjoy today. Your birthday is truly one of the most important events of life, let us go and celebrate it. This is the anniversary of your birth, baby girl, let us go out and celebrate it tonight! 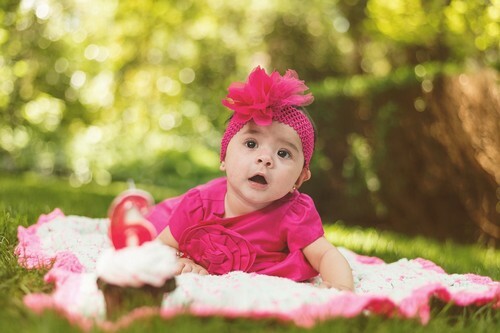 Your baby is adorable just like she always is, maybe we should celebrate her birthday. I just wish that my baby girl grows to be wise and a strong healthy child, until forever. I wish that you would live long enough to make changes in the world, my baby girl! Things will be tough for you when you grow up but I know you can do it, baby girl! There is no one in the world that will ever surpass my love for you, baby, I love you! Happy birthday to the most baby with the most angst in the room, enjoy your day, today. This day is as special as it gets because you are so cute and amazing, happy birthday to you! Your birth is truly something to have a celebration for and you know that, right? You will learn new things as another year passes you by, congratulations baby girl! You are another year older honey bee, I hope you enjoy this day of yours alone. 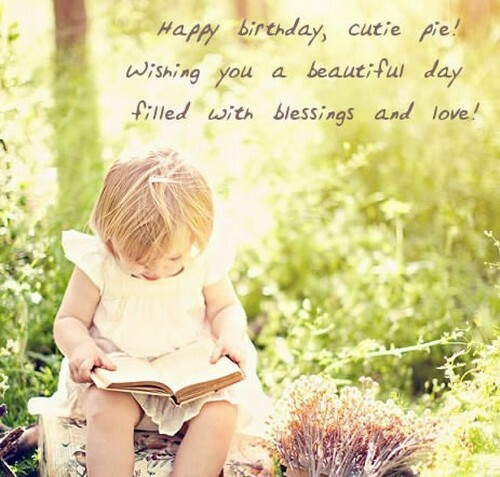 I am sending you the best wishes to the nicest girl in the world, our little girl! I bet that you are already in Santa Claus’ list even before the year even starts, girl. I hope that this day of yours gets filled with fun and happiness, sweetie, you go baby. Darling you have wings behind your back that you just cannot see yet but I really can. You are the sweetest girl I have ever seen in my life, please grow up to be the same. I wish I can fill your life with more happiness than any other birthday ever can, love. You are my sweet little one and that will never change no matter what, get that? You may not notice but I will always be there for you, in disguise or not, my little girl. 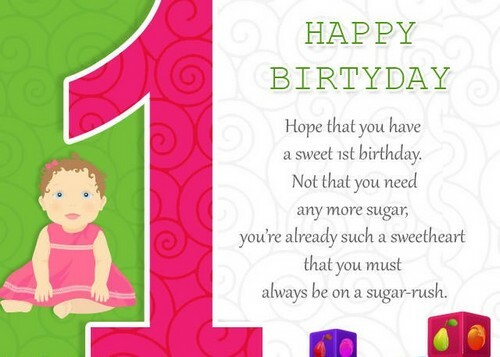 To the fantastic little one in the family, may your birthday be filled with tons of joy. 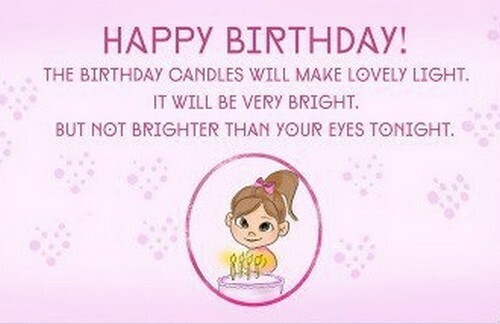 You are so sweet as you are kind and you deserve a birthday that really shines out. I see that you are sparkling in my eyes because I really love you, you tiny thing, amazing! Have tons of fun because you deserve that, I truly do find you amazing, so you know, dear. There is so much joy in your eyes and I can see that, I hope that sparkle lasts forever, love. Truly you are an amazing baby and that is enough to make everyone else adore you, girl. Your smile is so bright that I treasure it every time I see it and keep it in this mind of mine. You are the best person I can ever conceive and that is something new for me as well. I hope you appreciate all the things that I am doing for you now, later on in your life. I am going to serve all your favorites on this birthday of you, my little baby, you are cool. I hope that your guardian angel does a good job of protecting you from all the harm there. You are the best blessing I can ever ask for and I am thankful that I got you as my present. You are a bunch of happiness that I can never get tired of, may you have a great day today. There is something about you that sets you apart from the rest and that is what I love. I am totally in love with the way those freckles are spread across your cheeks, my baby. You are totally going to be an amazing woman one day and I cannot wait to see that. 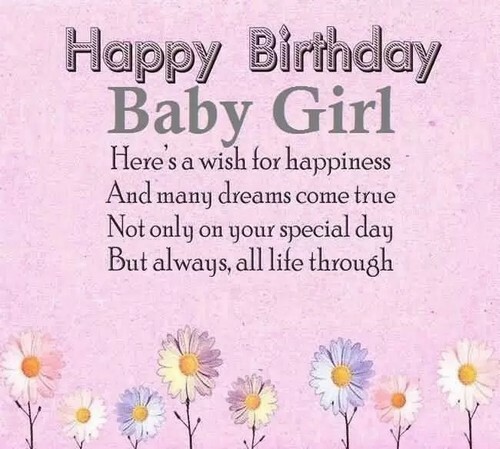 To all the friends and the family that I have, here is to the cute girl in the family! You are so adorable that it makes me cringe when I do not get to hug you little baby girl. You truly deserve to be happy so I hope that you are happy with what you have right now. Sending you the best wishes from all the people who love you from this side of the family. We are praying that you get well soon so we can celebrate your birthday, little one. You are the most adorable person that I have ever met and the sweetest too, happy birthday, cutie! The word is out and your big day is actually here and I think it is totally exciting as ever! 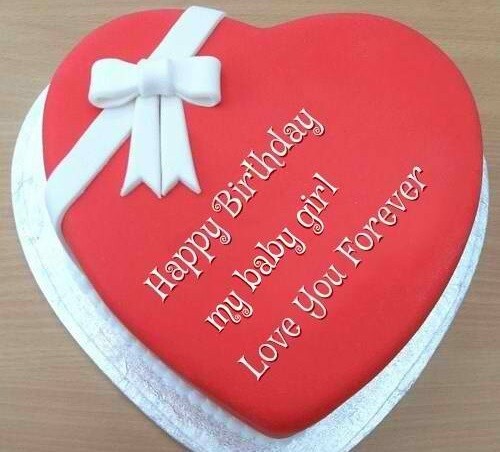 I am sending all the special greetings that I know just to be with you, happy birthday, baby. You are the loveliest person I have ever met and that is saying something about your parents. Your parents raised you up to be such an amazing kid so have a happy birthday party today! I hope that you get to remember me by the things that I told you, enjoy this day of yours! There you go frolicking in happiness and that is how I want you to remember this day! You get to have all your favorite candies, chocolates, cakes because today is your big day. Let us just get this straight off the bat, you are adorably cute in every single way possible! I hope you have so much fun today that you remember this birthday years from now on. I want you to grow up to be as charming and as caring as you are as of this very moment. May you enjoy the life that you are given, I promise that I will help you to that, happy birthday. Just live your life the way you want to and I swear I will be there for you all the time, baby. You may still be but little but you can already do great things, I am proud of you, baby girl. No matter what happens, you will always be my baby girl and that is the truth of it, I love you! I love the way you would always sneak out whenever you think I am not looking, baby girl! Just enjoy life and do the things that make you happy, you have so much time for that.